Baselworld 2017 is all set to be a bonanza for smartwatches, and first out of the traps is a familiar sounding name - Guess Connect. Actually, we've got a duo of new Guess Connect Android Wear smartwatches incoming. If the name is ringing a bell, that's because Guess already has a Connect smartwatch... sort of. The original Guess Connect was a hybrid watch that was the result of the fashion brand's partnership with Martian, styled after Guess' best-selling Rigor model. 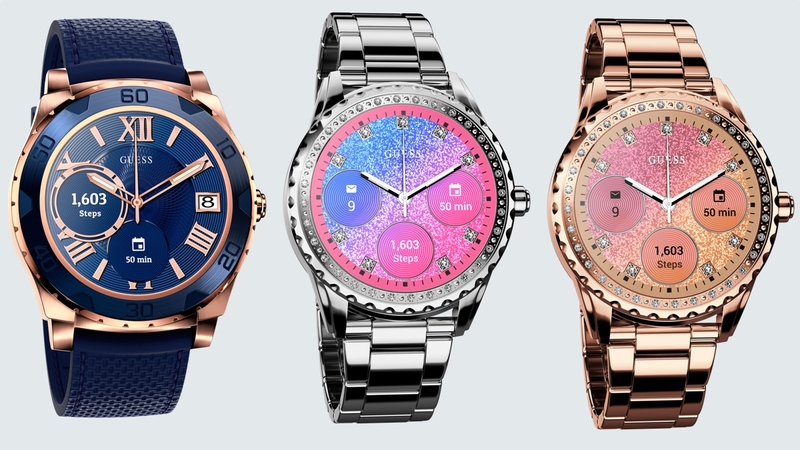 The new Android Wear Guess Connect models come in both 44mm and 41mm cases, therefore catering for both sexes while at the same time looking a heck of a lot like the original connected watches. Powered by a Qualcomm Snapdragon Wear 2100 chip and running Android Wear 2.0, there are a few different designs on offer - a navy blue affair, and a trio of jewel-encrusted metallic finishes in gold, rose gold and silver. We're told that over a hundred combinations of display face, colour, and subdials will be available. We'll update this story as and when we get more info as to what sensors are packed in and we'll also get the price details for you as soon as possible. What we do know is that the new Guess Connect Android Wear range won't be on sale until much later this year - 'Fall / Winter 2017' is the stated launch date. Wareable is over in Baselworld in full force this year and it's shaping up to be an incredibly busy show for wearable tech. Make sure you bookmark our dedicated Baselworld 2017 hub page for all the news at it happens, as well as hands-on first look previews from the Swiss watch expo.